The microscopic nano cosmos becomes your battleground on Wii U, as Shin’en Multimedia deliver Nano Assault Neo through Nintendo eShop. 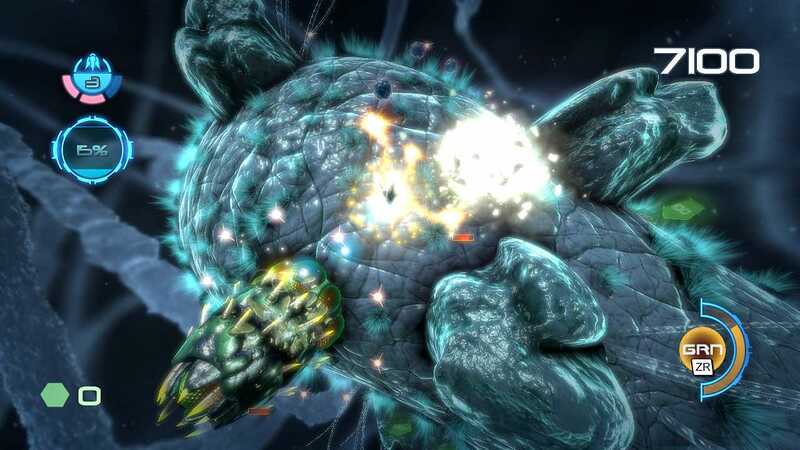 This twin-stick shooter will immediately recall memories of Super Stardust HD on PlayStation 3 as well as Geometry Wars: Retro Evolved which hit Xbox Live Arcade, for those that have encountered either title. The general gist here is that the player must neutralise a deadly Nanostray virus, traversing micro-organisms known as cells to do so. The terrain across these varies, with four clusters (Epsilon, Zeta, Omicron and Sigma) further dividing themselves across sixteen separate levels. Each cell has their own gravitational pull, akin to Super Mario Galaxy, with the player steering their ship across all sides of their surface as they hunt out bugs to eliminate. Along the way, you’ll be able to nab pickups, either increasing your score or enhancing your weaponry. You can acquire up to four satellites for your ship, each granting an additional gun that improves the breadth of damage you can deal. This soon becomes problematic, however, with the screen soon ablaze with laser shots firing everywhere, which, in places, can quickly become confusing with enemies blasting pink shots back in your direction. When not playing off-screen with the Wii U GamePad, you can tap the screen to bring up a menu that enables you to choose the direction in which your satellites aim. Such customisable use of your standard weapons is a great addition, that is if you can afford to divert your attention away from the chaos on-screen. Sub-weapons grant further opportunity to gain the upper hand, diversifying the way in which you attack. These are coloured, and incorporate energy lashes or homing multi-lasers. With no pre-set choices, the difficulty across the game is as rampant as the organisms you battle across. You can move from a relatively straightforward level to another, more cluttered. It isn’t a game breaker but certainly an aspect that could easily begin to frustrate. The level exit will appear once you’ve expunged over 90% of the critters crawling around, yet completely purifying cells will yield greater reward and increase your chances of achieving those elusive high scores. You’ll have to be quick though, as once the exit has opened a countdown timer begins and you have just 30 seconds to make your way across to it before it closes. Bosses themselves, which take up four of the sixteen levels that the game offers, are basic and uninspired. The player required to target weak spots, whilst dodging behind terrain to take cover from incoming projectiles. These disappointingly prove far less of a challenge than the rest of the core game. Between stages you visit the Nano Shop, purchasing upgrades such as the Credit Doubler, additional Satellites, sub-weaponry, or a Nano Shield that briefly protects you from harm. These ease your progression through the game, as long as you spend wisely. Online rankings across all modes are a welcome addition for those with a competitive edge, with your remaining life, hit accuracy and the time left on the clock once you arrive at the exit providing opportunities to gain bonus points. Beyond the single-player campaign, there is a two-player co-operative mode that allows one player to use the Wii U Pro Controller with the TV whilst the other makes separate use of the Wii U GamePad. Arcade Mode is also available, allowing you to select any individual level to play, with Missions providing further goals, such as completing an entire cluster without losing a life, for you to elongate your play time. Visually, Nano Assault Neo is an astounding spectacle, and it is hard to decry boasts from the developer that the game runs at 60 frames per second. The presentation is smooth, with enemies and environments remaining continually well varied and vibrant. However, beyond its pyrotechnics Nano Assault Neo sadly proves an uninspired experience that fails to elevate itself above others within the genre. Which is surprising, considering the usually creative output from Shin’en Multimedia.